Waterlogged boots / 1.5KG each? Thread: Waterlogged boots / 1.5KG each? Alright so I've just come back from another hunt for the last 10 odd says, gallivanting around the southern alps. My Lowa Tibets have been soaking wet about 95% of the time. LowaNZ states 1 boot is 900grams. 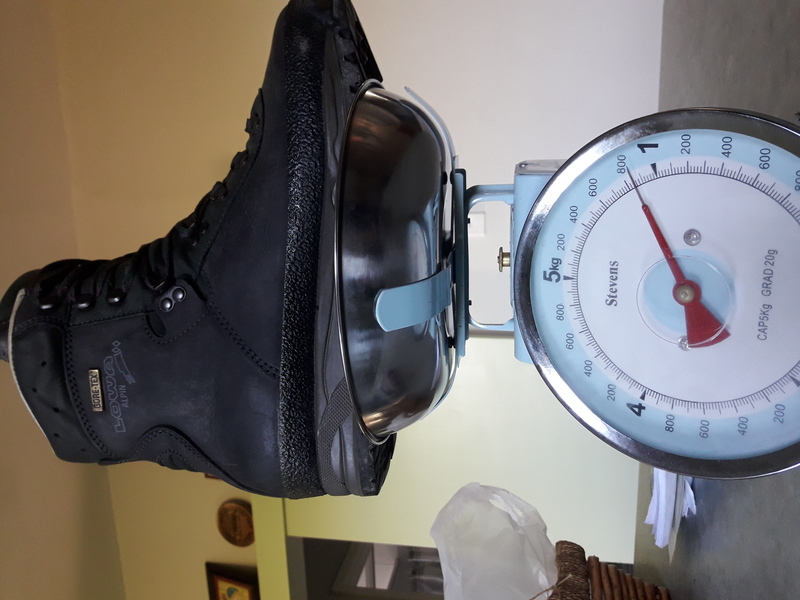 I have just weighed one of my boots and it comes in at just under 1.5kg. That seems insane. That is a substantial weight on each foot. I'm not keen to be lugging around these blocks on my feet, I personally don't find them that comfortable either. I have done some research and Crispi have released a new boot called the Thor GTX. These come in at 566grams per boot, dry. Apparently they dry very fast due the material beign a synthetic/condura blend. They are also waterproof. They have received very good reviews. Anyone had experience with Crispi? I'm wanting to order a pair overseas as I don't think I can try on a pair here. I'm US11 in Tibets if that helps. If you check out "The Gritty Bowmen" on YouTube they seem to rate them pretty highly. hotsoup and xtightg like this. I have the same issue my boots weigh a ton and take days to dry if not a week when wet, just picked them up they weigh 2 kg dry . Interested in your findings I have been looking for a boot with no insulation to soak up and hold water. I used to use British army leather boots with elasticated Gore-tex socks over a pair of Thorlos trekking socks. I wore a thin pair of socks over the Gore-Tex to give them some protection. When your Thorlos got wet take off boots and socks, dry feet and give the Gore-Tex socks a wipe over put on spare socks with dried off Gore-Tex socks with wet thin socks over the Gore-Tex instant dry feet. Hang wet Thorlos from rucksack rinse and repeat. Plain leather boots did not hold water and dried faster than my expensive ones. Had these Gore-Tex socks for years lost them cant find the same ones again they were green elasticated well fitting Gore-Tex with an calf length elasticated cuff top. Will have a look at Crispi and interested in your feed back on the forum. Last edited by xtightg; 24-04-2018 at 05:05 PM. That’s the main reason went to Salomon Quest 4D GTX, the only time I use my Lowa Tibet’s is tahr hunting or in the tops of the Kaikoura’s. Those Crispi boots do look the good, I wonder how long the Stitched PU (polyurethane) coated leather full rand would last compared to a rubber rand? I have gone through regular waterproofing on my Tibets, that doesnt stop them getting clogged in water that takes over a week to dry. I have the same problem. I have Meindl Island boots which are full leather and my son has a cheap pair of synthetic boots from Kathmandu (his feet are growing too quickly to buy him expensive boots). We are in and out of the river a lot when hunting, and my boots get waterlogged. I can get my sons boots dry during the day, but mine are just too wet. I have looked at the synthetic or synthetic/leather composite boots, but I think they are too lightly built for the price - have had the Meindl boots for at least 4 years, but would be surprised if I could get 2 years out of the synthetic boots. Much as I don’t like walking around with 1.5 kg boots on each foot, especially on a frosty morning, they have been great boots and I will more than likely replace them with similar ones. Might be quite different if you are not continually getting them full of water by crossing rivers, though. The leather on my boots is chock full of fairly light snow seal. There is sod all room for water. try the salewa boots. they are a revelation.very lightweight and hardwearing too. STORM leather condition & a german waterproofing/conditioner that someone recommended in another thread. I always let my Tibets dry after a big trip, I'd then deal to them with this stuff, ensure the whole boot was covered and rubbed in. Anyway, I have ordered a pair of these Crispi Thors, I like the idea of having a boot 50% lighter, plus I like new stuff. May do a review on them once I have some KM's under the belt. Always wear pretty heavy heavy boots as often carrying big loads out at the end of the day. Mainly wear Meindl Makalu pros and Lowe tibets. Have started wearing new style modern predominantly synthetic Fitwell boots now. Last winter I brought a pair of Fitwell Sirius Winter boots and absolutely love them. They have around 6mm of thermal insulation built into them for winter use. They have been an absolute revelation for my winter hunting. Relatively light for a heavy boot and they don't take on much weight when water logged due to the synthetic materials. But they do have a very nice light leather ankle inner lining. Mountaineering boots - SIRIUS WINTER - Fitwell S.r.l. I liked them so much that I brought a pair of the Surius ( non winter ) boots for normal alpine hunting. They are similarly bloody awesome. Like wearing slippers around the mountains. The comfort level is off the scale. Same light leather inside ankle linings. I often end up back at camp after a long hard day on the hill and realise I still have them on and laced up tightly. Just so comfortable I don't care. Previously I would be just dying to take my boots off. Mountaineering and Canyoning boots - SIRIUS - Fitwell S.r.l. Outwardly the only obvious difference is the colour of the boot laces. Yellow for Winter. Red for Summer. They are available from the link below in NZ. This guy brings in mainly Snowboard gear and therefore has the winter ones generally in stock for snowboarders who do some climbing to get to remote runs. He might have the summer ones in stock or you might have to order your size ... but they are seriously worth the wait.